What do you think is the biggest threat to the planet? No, it is not war, it is not obesity, it is not smoking, and is not malnutrition. This is killing more people than those mentioned, but do we even care? It is everywhere, killing people slowly by slowly, did we even make a move to fight against it? What problem am I referring to? It is POLLUTION. Were you able to recognize it as you drive on your way to work? Were you able to notice it as you see people throw garbage, improperly? Or are you one of the pollutants in the world? Time to check some facts. 9 million people died prematurely from pollution-related diseases in 2015, accounting for 16% of all deaths worldwide. 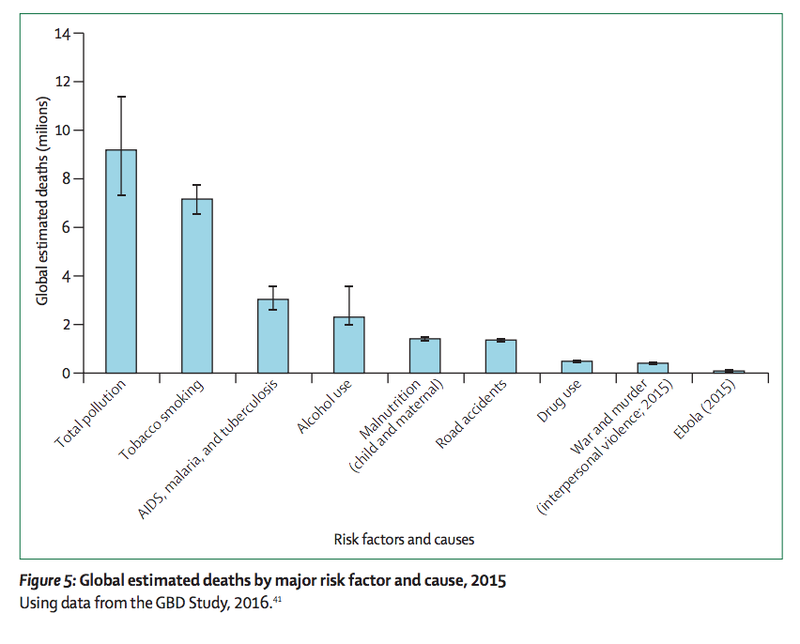 Almost all of the pollution-related deaths are happening in poor and developing countries. This costs the world an estimated $4.6 trillion a year. Dirty air, water, soil and work environments are killing people off at an alarming rate. Researchers who have tallied up these effects say environmental contamination is now among the top global killers, responsible for one in six deaths worldwide. Pollution is more deadly than smoking, kills nearly 15 times more people than all the world’s wars and violence combined, and is three times as deadly as AIDS, malaria and tuberculosis all put together, killing a total of nine million people a year, according to a report released by The Lancet Commission on Pollution and Health on October 19. Air pollution is by far the worst offender, but add in contaminated water, dirt and unhygienic working conditions around the globe, and it becomes apparent that pollution is more dangerous to people than heart disease, the number one leading cause of death worldwide. “No one has ever pulled together, in one place, information on the toll of disease and death attributable to all forms of pollution,” report author Dr. Philip Landrigan, who’s been studying the effects of pollution on child health for decades, told The Lancet. He says the dangers of pollution are often hidden from the public eye, because information is folded into separate statistics. The report authors say the new pollution numbers are “intimately” linked to climate change mainly because of air pollution, which is a major source of greenhouse gases. Fuel combustion of all kinds “accounts for 85% of airborne particulate pollution and for almost all pollution by oxides of sulphur and nitrogen,” according to the authors. Fossil fuels, inefficient cook stoves in the developing world, and slash and burn agriculture all contribute to bad air. The good news is that pollution rates from things like smoky cook stoves and unclean drinking water are going down, as low- and middle-income countries emerge from poverty. But in many places, the deadly toll of pollution is only going to get worse unless cleaner energy sources are tapped, according to the report. As high-income countries continue to burn massive amounts of fossil fuels, rapid rates of development in poor and middle income countries compound the global air problem. Cities, responsible for 75% of the world’s greenhouse gas emissions, are especially deadly — nearly 90% of urbanites worldwide are breathing air that doesn’t meet World Health Organization air quality standards, the report says. Development efforts often mean more mining, higher rates of deforestation, increased use of insecticides, bigger electricity generation demands, and more gas-powered cars on the roads. This all comes at a cost, the authors say. Productivity losses from what they refer to as “unhealthy and unsustainable development” are prompting illness and death that rob the world economy of 2% GDP annually. It doesn’t have to be this way. In the US, air pollution rates have dropped more than 70% since 1970 — the year the Environmental Protection Agency was founded — while the country’s GDP has skyrocketed. The study authors argue that in the same way developing countries leapfrogged past landlines and dial-up to mobile phones and broadband, many countries could skip over smoggy versions of industrialization and tap into renewable energy sources like solar power and wind generation. If not, the statistics will only get worse, with the number of deaths due to ambient air pollution on track to increase by more than 50% by 2050.